An arch window (also known as a radius window) creates a dramatic effect in both contemporary and traditional homes. You can add an arch window to nearly any other window style to create a window configuration with more flair or elegance. Or you can use an arch window to make a striking door transom that lets more natural light into an entry. 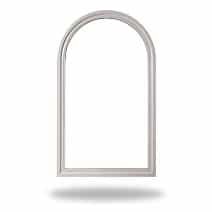 An arch window can be tall like a casement window or wide like an awning window. While some manufacturers offer an operable arch window, others can be combined with an operating window to enable both flair and ventilation. Particularly dramatic effects for contemporary or modern homes can be achieved by banks of arch windows. In traditional homes, arch windows can be used to create a Victorian-like effect.